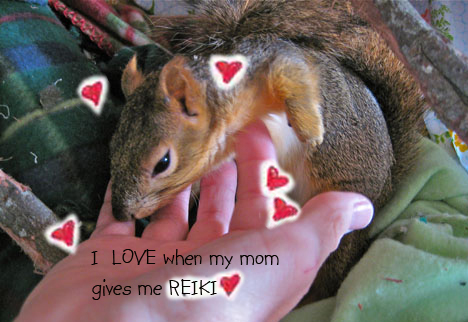 Reiki is Love: Animals LOVE Reiki! One of the most awesome blessings of practicing Reiki is the ability to share it with our dear animal friends! To give Reiki to a suffering pet indoors or even an animal that lives outdoors is so effective... I think even more effective than giving Reiki to people. For one thing, people have all kinds of questions and considerations about Reiki. For example, "will it work? ", "how does it work? ", "what if I don't believe in it? ", etc. 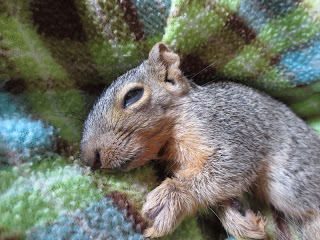 On the other hand, when I give Reiki to an injured squirrel, s/he just receives it and the results show up very quickly! 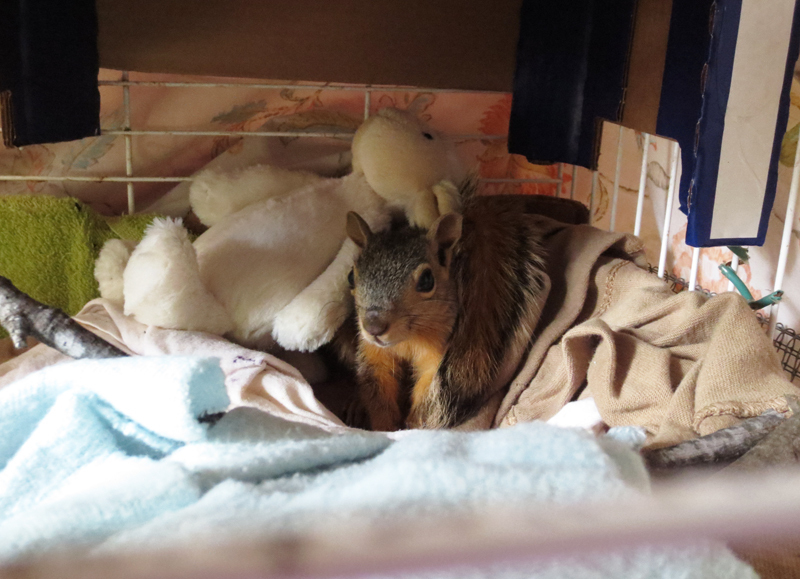 Not long ago, I received a baby squirrel that had been found in the back of a storeroom behind an Austin business (Mango Money Center). The little squirrel had been nesting in the storeroom and apparently, a predator got in there and killed it's siblings and mother. (Her two sisters were found half eaten.) This poor thing was starving and did her best to survive for who knows how long! When I got her home, I tried feeding her some fluids, but she seemed to have one foot in the other world... one minute she was present and the next minute, she seemed to be far away. I then laid her on my heart and administered Reiki healing. I said the Reiki prayer and then sang love songs to her as I kept giving her the much needed life force energy! After about an hour, I laid her in some soft bedding with a peeled grape at her side... just in case she came around. When I got back from running an errand, to my utter astonishment, Mango had started eating the grape and even more amazing was the fact that she was totally back inhabiting her body again! When an animal is so far gone, it is unlikely that food alone will let them survive. There has to be the will to live!.. that means there has to be enough life force energy for life to continue! From that day on, Mango has just gotten more and more healthy! Mango with a new lease on life! The great thing about Reiki is that it can be used at any time, at any place, and on anyone. Reiki is simply Divine Grace/Universal Life Force energy and is whole, not dual. Therefore it is always safe and cannot do any harm! Do you know of an animal you would like to treat? Maybe it's time for you to open yourself the the best health insurance available- REIKI!! !